Celluloid bindings can deteriorate to such a degree that replacement is necessary. Thru the years I have used different methods in an attempt to "solidify" decaying binding but the results were never satisfactory in my opinion. Loose binding is often an accident waiting to happen. It is easy to snag and in one quick moment you may be holding the broken piece in your hands. When that happens, hold on to it! In many cases it is a very simple matter to glue it back in place. when multiple pieces of laminated binding are used. Sometimes we're not as lucky though. The binding gets lost or is damaged and can not be reused. This is when we my opt for grafting in a new section of binding. The channel is cleaned of old adhesive, and the edges of the remaining binding squared up for a cleaner blend to the new patch of binding. 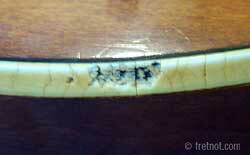 After the glue has cured, the newly inserted patch is scraped level with the surrounding binding and sanded smooth. Some deterioration is so severe that the binding begins to crumble and break loose in very small pieces. When faced with this kind of decay it is necessary to remove what is left and replace it. 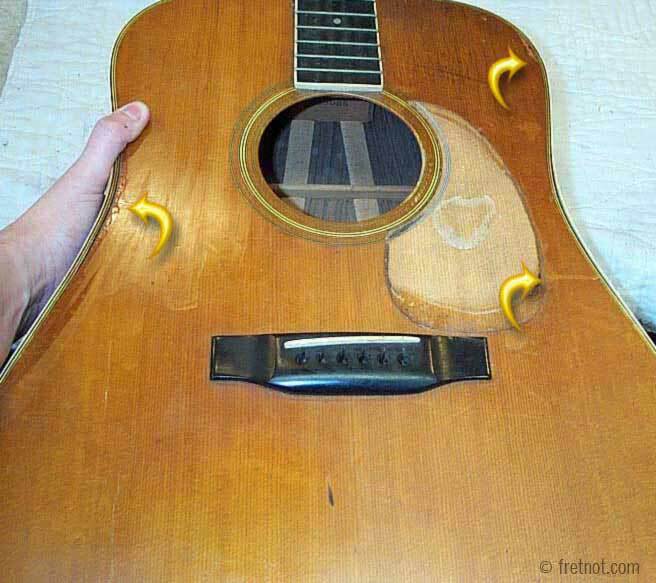 In some cases, crumbling binding can be lifted or picked from the channel with relatively little effort. 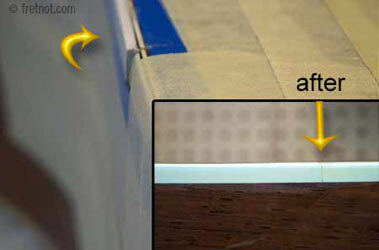 Great care must be taken to avoid damaging the routed channel in which the binding is glued. Light scraping may be required to remove left over adhesive but care must be taken to avoid changing the shape or depth of the channel. In order to get the multiple lines you see around the edge of an instrument many pieces of binding may need to be laminated together. Binding is often coupled with an inner decorative strip known as purfling. 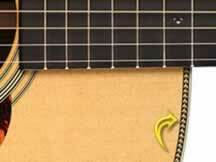 The herringbone pattern around Martin's HD-28 would be the purfling. With the channel clean and ready for new binding, it's depth can be measured to determine the width needed. Binding is sold in various materials, colors and thickness. In many instances multiple strips are used. Looking closely at different instruments you may count 3 or more pieces laminated together to provide multiple black/white/black stripes. In order to glue multiple strips together, I feed them thru a Delrin© vice which presses them together after acetone has been applied to soften them and provide cohesion. Some leveling at the edge of the binding may be necessary to remove the manufacturers tooling marks prior to installation. Thick, multiple bindings may be too stiff to bend around a tight radius once laminated. In such cases I may choose to carefully heat and bend them to shape prior to gluing. Plastic bindings are shaped using a modest amount of heat from a heat gun so that they will become pliable and conform to the shape needed. Wood binding is shaped in much the same way as the sides are bent. The types of glue used for new binding installation will vary according to the material being used. Again I will emphasize the fact that most binding adhesives will quickly damage the finish and soften the binding. As a result, do it yourselfers should avoid practicing on a high dollar instrument or you my find yourself with a real mess. Glue oozes from the joint when tape is applied and it is easy to spread the mess from fingers to finish. For this reason I will mask around and protect any part of the instrument that may come in contact with glue or my fingers. When using acetate based glue's such as Weld-On I prefer to use a vinyl tape, specifically 3M's 471 blue tape as it resists bleed through. Here is the step that truly tests your patience. Once the binding has been glued in the channel it must be scraped flush with the surface to provide conformity. I use small wood scrapers to remove the bulk of extra binding thickness. While this is a simple task when building a new, unpainted instrument, the process is far more difficult now that we are trying to avoid damaging the finish. Rebinding certain instruments can prove to be a huge job, especially on something like a Gretsch Country Gentleman, which are notorious for binding decay. Quite frankly I have done my fair share of old Gretsch's and have no desire to do more and I'm sorry to say it's difficult to find others who do. I have heard of those charging over $1,500 to rebind one and I completely understand. While a professional re-bind of a Gretsch Country Gentleman does wonders for one's reputation, they are so demanding that I lost money on every job. Once the new binding has been scraped flush with the sides and top it must then be oversprayed in some cases. Most vintage instruments require some tinting or aging techniques to assure it looks appropriate, the thinner the instruments finish, the easier the process tends to be. 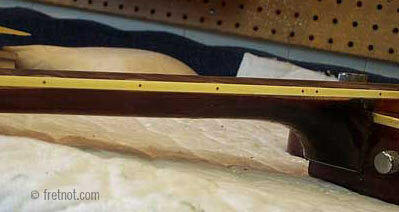 After achieving the appropriate hue a clear finish may be necessary on some instruments. Gretsch Tennessean with new fingerboard binding which has been aged.